KI Store is proud to provide quality Christmas ornaments to complement almost any themed Christmas decoration with the perfect ornament! Product quality and customers satisfaction are our top priority. Please feel free to contact us if you have any suggestions, or questions about any of our products or the quality of service that you are given. Christmas balls Ornaments are done in 4 special finishes: Shiny, Matte, Glitter and Shiny Swirl. 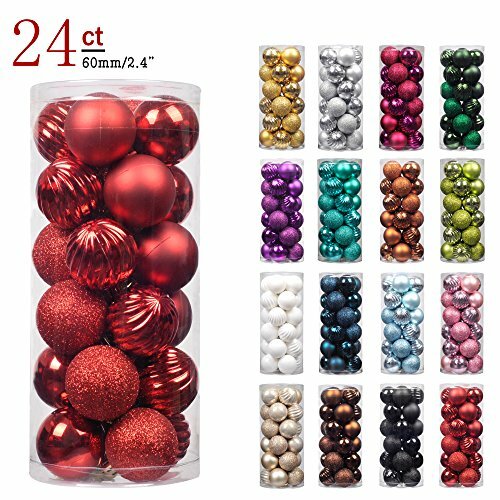 There are 16 different colors of decorative balls allow you to build your collection quickly and decorate with more possibilities. Make great addition to your Christmas and holiday decoration. Perfect home decor for a variegated display of Christmas, wedding, engagement, anniversary, party, as hanging ornaments on tree branches, table centerpieces, around banister, above reception at different lengths, etc. It is also a great choice for commercial holiday decorations. Hooks for Christmas balls included to make hanging easier, Balls are equipped with Caps, String Hangers. Dimensions: 2.36" (60mm) in diameter. Material(s): plastic/glitter.